Laravel is a web application framework that incorporates expressive and elegant syntax. It offers a full-stack solution for front-end as well as back-end developers. It comes with a built-in SCSS and script collector. All the relevant modules are connected as service provider packages. It uses a notable Blade template that allows users to aggregate webpage slicing from the PHP code. Caching, working with file storage and multiple databases. Task scheduler, task queues, console, work with SSH. WebSockets support to develop real interactive apps. Flexibility possibilities to rewrite REST API. This is a multi-level framework based on MVC architecture, designed to build web application by using database. It is one of the most powerful tools that are used to create web applications for various websites. One of the highlights of Ruby on Rails is the speed of development. The high speed is determined by an extensive set of ready-to-use standard RoR tools, pre-created solutions in the community, the Ruby language and simple coding. YII is a component-based PHP framework designed to develop large web apps. It enables developers to optimally utilize the code, reuse the concept and speed up the web development process. YII is a universal framework that can be used in multiple types of web apps. It is suitable for large development projects including portals, forums, CMSs, stores and RESTful application. Enables you to cache the entire page and separate fragment. Enables you to work with forms effectively ensuring development and validation. Ability to connect third-party libraries. Enables automated testing and TDD style development. Django is a Python-based web application framework. DRY (Don’t repeat yourself) is one of the essential principles of the platform. It is developed from multiple apps that are suggested to developed detachable and connectable. Enables fast development, making it suitable for developers who are working on deadlines. It comes with various features that help with user authentication, content administration, website maps, RSS, etc. Protection against security errors that may influence the project. A good option to work on projects that require high-level web traffic. The ASP.NET MVC platform is a framework designed to develop websites and web applications, integrating the MVC pattern. It offers high convenience, flexibility and various usage. Additionally, it also ensures a high productive coding model, allowing users to develop purer code architecture through testing. The framework supports ubiquitous extensibility. Flask is a robust Python web development framework that does not use any tools and libraries. It is a widely used framework for operating web applications using mixed devices. It integrated Unicode-based maintenance and strong documentation, thereby decreasing a lot of manual tasks for programmers and design analysts. Furthermore, it also has a restful call dispatch that offers authority to the framework by implementing inter-network mechanism. The quality of code augmentation enables developers to replace contemporary phase to attach solicited characteristics. Each of these frameworks come with its own set of advantages. Deciding a web development framework primarily relies on the features of a particular project. 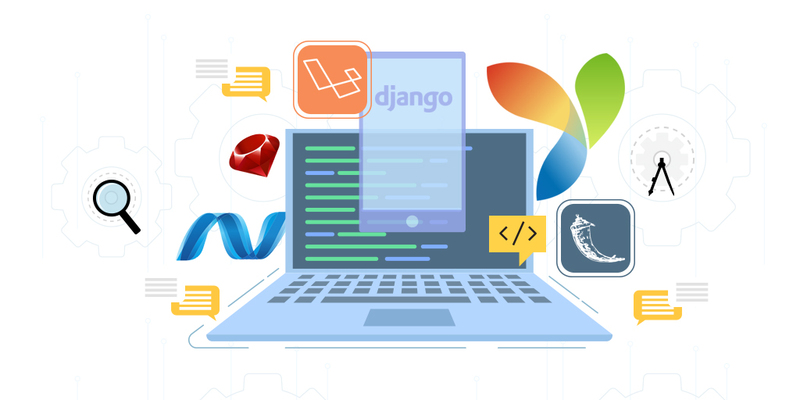 Above are some of the top web frameworks of 2019 that offers strong support to the overall development process and speed up the development process in the most effective manner.